In all “Throwback Thursday” spirit, I figured my love for vintage stores could come in handy. A haven for both shoppers with big wallets and thrifty budgets—Manhattan is a treasure hunt for vintage fashionistas at many locations. Whether you’re looking for more commercial, mainstream looks or a hipster vibe, each shop creates its own atmosphere and draws different customers to search the serendipitous depths of the stocked shelves. I took the liberty to hunt through these stores for you and report my findings so you can get a head start on your quest for vintage finds. 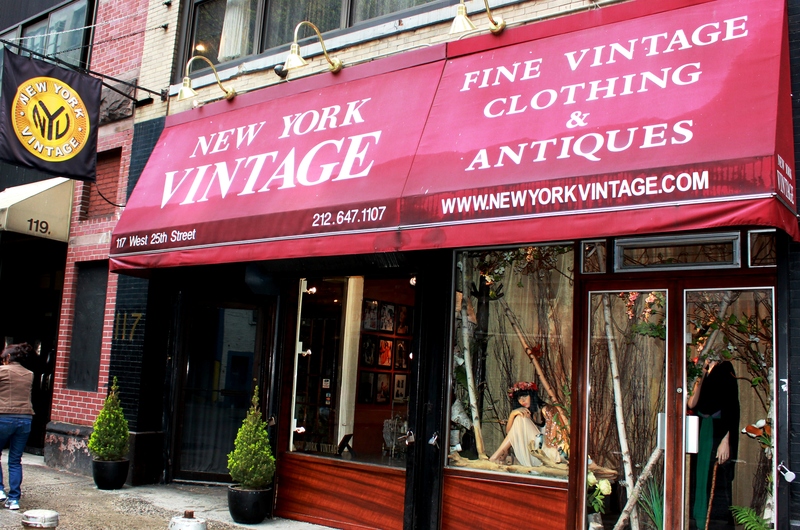 Walk into a dimly lit, small space filled to the brim with designer goods and you know you’re at New York Vintage. You’ll feel like a little girl playing dress up when looking at these pieces—the options are endless and some museum-worthy. Fabulous names from the past and present—think Chanel, Balenciaga, Norman Norell, and Dolce and Gabana—filled the clothing racks. Big brimmed hats, dazzling jewels, and tiny shoes stood out amongst the clothes. The associates were super friendly and knowledgeable about the clothing. For a vintage-seeker, this store is a dream-come true! Nothing is mainstream or bottom line. Every piece is hand-selected and stored with care to browse. Featured in many magazine photo shoots, prestigious store windows at flagship stores in NYC—New York Vintage is the ultimate high-end store to discover hard-to-find pieces from names of the past. This store is for big budgets—not the thrifty shopper. Rachel Zoe’s version of heaven.